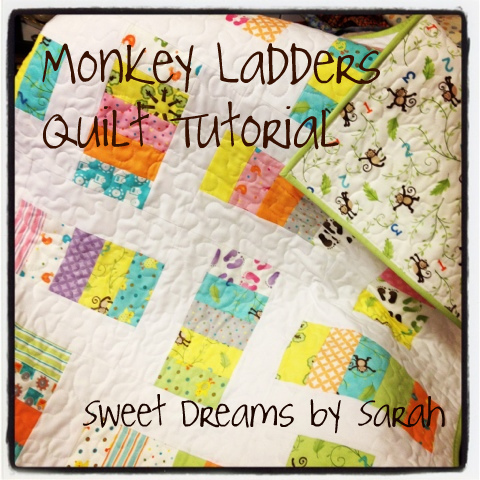 Love this darling quilt from Sweet Dream by Sarah...and it's a tutorial! Yay! I definitely love a pattern that lends itself to showing off your favorite prints, and that's what she did here. Super sweet and simple, great variation on a coin quilt. 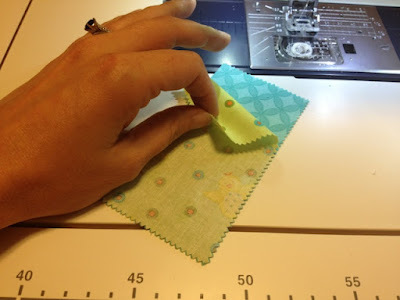 Make sure to check out Sarah's shop, her finished projects and some more great tutorials. Thanks Sarah for sharing! These little monkeys had me at hello! I had no idea what I was going to do with this charm pack when I first spotted it, but I had to have it. Cotton batting, approx. 45" x 45", to give you a little room while quilting. All measurements assume you use a 1/4 inch seam! Take the 40 charms that you'll be using, and cut them in half, so that you have 80 strips that are 2.5" by 5". Don't worry about keeping them in any particular order, since you'll actually want them to be randomized in your quilt. 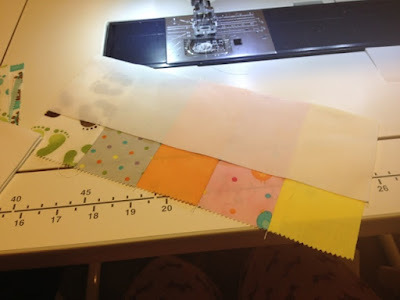 Cut 8 strips from your background fabric that are 3.25" wide by WOF (width of fabric from selvage to selvage - assumed to be 42" - you will need to make adjustments if yours is different!). 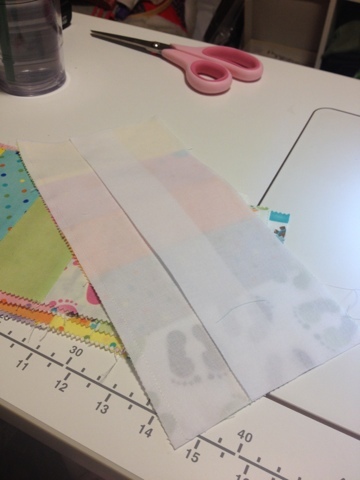 Subcut these strips into 10.5 inch lengths, so that you have 32 pieces that are 3.25" x 10.5". Cut an additional 5 strips that are 2" by WOF. 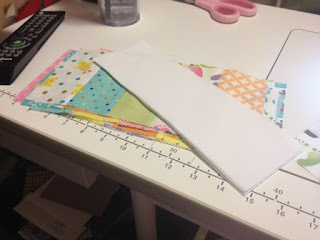 Cut your backing piece along the fold so that you have two pieces that are half the WOF by 1 1/4 yds long. 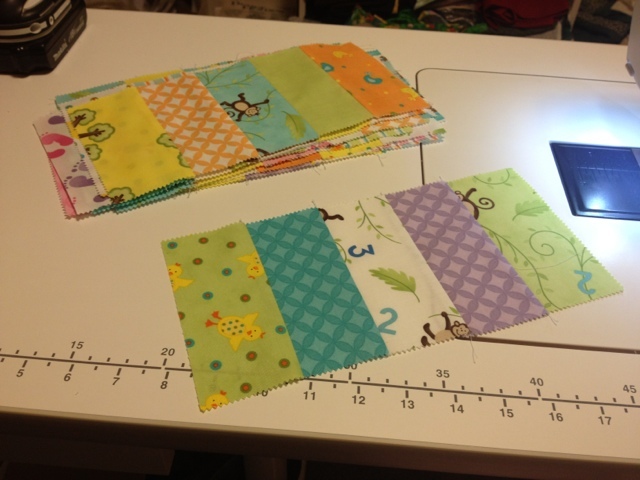 Cut 5 strips 2.5" by WOF for binding strips. Your goal is to make 16 sets composed of 5 strips each. Pair up the strips and sew along the long edge. I recommend pressing after each seam, but the great thing about the way that this quilt is pieced is that it doesn't matter which way you press the seams - there won't be any matching up of corners or points here! Press the seams toward darker fabrics where necessary. Next, we add the white 3.25" by 10.5" strips on the sides to finish out the blocks. Take one strip and align with one of the sides of your strip set. 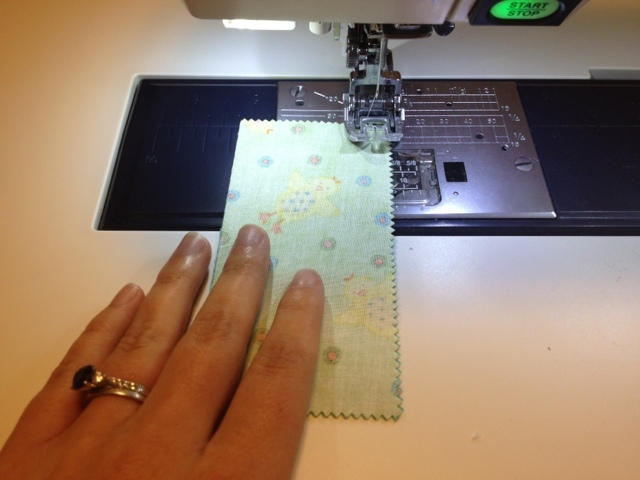 You can pin this, if needed, but if your seams are ironed nice and flat, it shouldn't move around on you too much. Stitch these pieces together. 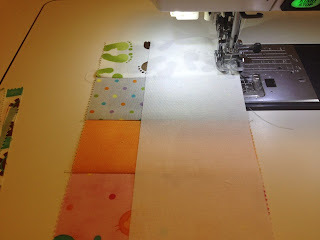 Hint: chain piecing here can make this step go by very quickly! Once one side is sewn on, flip the block around, and sew the strip on the other side. I would recommend NOT pressing before this step! Keeping the first strip right where you sewed it will help you to get the second strip aligned and will help to keep the block nicely square. Once both sides are sewn on, go ahead and press those strips out! Now you've got your 16 blocks ready to go! 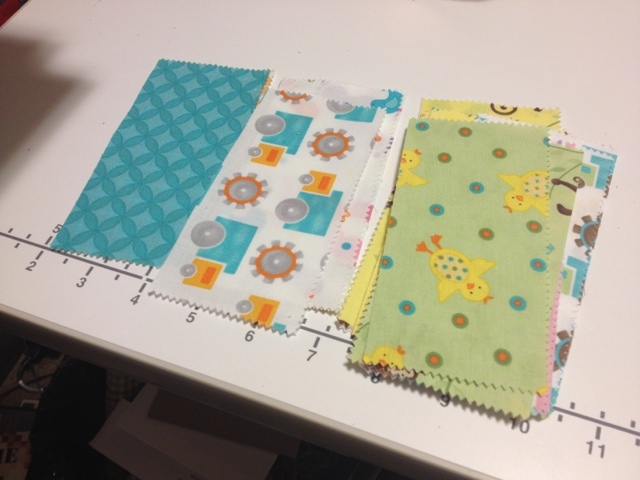 Note: this picture of the block was taken after the others were sewn together! That white strip on top is actually from the adjacent block. 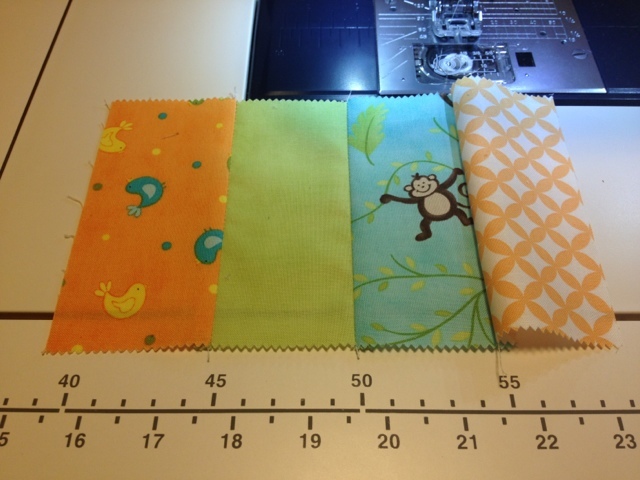 Lay them out in alternating direction, keeping an eye out again for the randomness of the fabric placement. Arrange the blocks in a 4 by 4 arrangement. Once you've got your blocks set out in the arrangement you like, start stitching them together. I'm not a fan of long seams, so I usually sew the blocks together in quadrants, and then sew the 4 quarters of the block together. 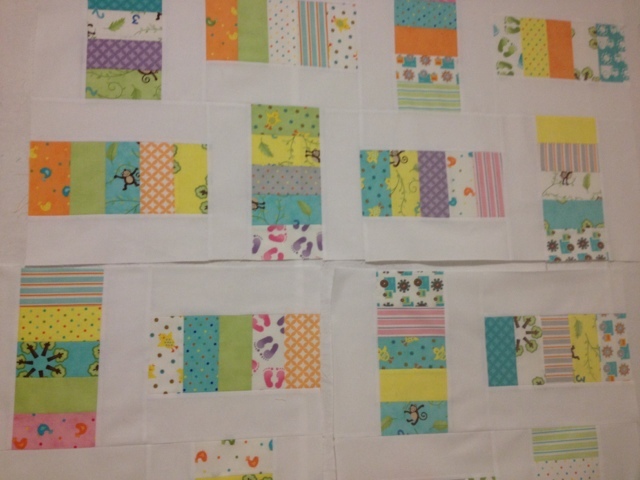 Once the 16 blocks are sewn together, it's time to add the border. Take the 2" background strips that you cut earlier, and snip off the selvage ends. Sew one strip to the edge of the quilt, and then use a ruler to trim off the edges, to keep the quilt top square. Do the same on the opposite side of the quilt. That finishes up the quilt top! 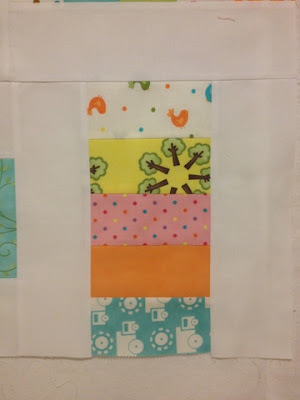 Sandwich up your quilt - backing, batting, and quilt top. Baste, and quilt as desired! I used an all over meander on mine. Stitch together your binding strips, and bind the quilt using whichever method you prefer, and you've got yourself a quilt! As a side note, my version of this quilt is currently for sale over at my Etsy shop! This is such a great use for a charm pack! I love that you only need one of them to make the pattern! I LOVE this pattern! I'll be using it soon. Thank you! Wow, this is really beautiful with the white background. Such a great baby quilt.